Guest: You said that all the different religions are stop-gap measures. Hansadutta: At best. Now they are just gaps. Guest: Does that mean they don't really have anything to do with realizing the supreme Absolute Truth? This verse we were discussing last meeting, that we should eat after offering sacrifice. Lord Krishna says that things which are eatable, we receive by the grace of the Lord. We should acknowledge it. We should not be forgetful, that our eatables, which come to us, they can be manufactured by our sweet will. No. The arrangement is so nice in the administration of nature that we shall get all our necessities of life by the grace of God, and our duty is to advance ourself in the right knowledge of our spiritual existence without unnecessarily engaging ourself for sense gratification. That is the difference between human civilization and animal life. The beginning of our Bhagavad-gita lesson is based on that we are spirit consciousness. We are not this body. And the whole function of the human society is to be enlightened in that spiritual consciousness of life instead of wasting time in sense gratification like the animals who are concerned with eating, sleeping, fearing, and mating. That is the background of our, this discussion, that we are different from the ordinary animals. So the common factor of animal life and human life is these four principles of bodily demands, namely that we require to eat, and we require to sleep, we require some defensive measures for protecting ourself from the enemies, and we require some extent of sense gratification. That is the needs of my body. They are not the needs of my self as I am, spirit soul. Now, if I want to get rid of this bodily encagement or the threefold miseries of material existence, then I must put myself under treatment. Just like a diseased man goes to a physician for treatment to get out of, get relief from the sufferings of the disease, similarly, our material existence consisting of threefold miseries and birth, death, old age, and diseases... If we are actually conscious for our happiness, we must make a permanent solution of these miseries. That is the mission of human life. So for making that mission fulfilled, we have got developed consciousness than the animals. That developed consciousness should not be misused only for the animal propensities of life. That is the whole thing. And therefore Lord Krishna says that in order to reach to that stage of perfection, you should work. Your work should not be stopped. We have already discussed this point, that niyatam kuru karma tvam karma jyayo hy akarmanah , that "Your prescribed duty should be prosecuted nicely. Go on. Don't stop it, but work for the life of karma-yoga. Karma-yoga. Ordinary work is called karma. Ordinary work is karma. And when it is added with yoga, that means spiritualized work. Yoga. Yoga means spiritual perfection or linking up with the Supreme. So karma and karma-yoga, there is gulf of difference. Karma means ordinary work. I work whole day; I get some remuneration and enjoy for my sense gratification. That is called karma, in this life or that life or next life. Somebody, they make charities and other pious acts so that in their next life they get good parentage, good education, opulence, so that they can also enjoy life. There are others also who make more advanced karma to get himself promoted in other planetary system. Just like moon planet, or Svargaloka, heavenly planet. There are many planets in which the standard of life is far, far comfortable than here. So these are not required. To get yourself promoted in higher standard of life, from C-class prisoner to become A-class prisoner, that is not required. Bhagavad-gita does not teach us that you improve your life in the respect that you are now C-class prisoner; you become A-class prisoner. No. You should not remain a prisoner. You should get yourself out from this prison life. This material life is prison life. Just like in prison house we are forced to undergo some sort of miseries. We may agree or not agree; we have to undergo. In prison life you cannot deny. The state agents are there. He prescribes some work; you must do it. If you say, "No, I cannot do it. I am not accustomed to do it, no." Then you'll be again more punished. Similarly, this is our prison life. This material existence is our prison life. And prakriti, nature, is the forceful agent. She is always enforcing us to do, to act. Prakriteh kriyamanani gunaih karmani sarvashah [Bg. 3.27]. So this is going on. Now, if you want to get rid of this imprisonment, then you should begin this karma-yoga, karma plus yoga. Yoga means in connection with the Supreme. That connection with the Supreme begins with this formula, yajña, sacrifice. What you are going to sacrifice? What you have got? Everything is given by God. Anything which you possess... You have not brought anything with your birth. You have come naked from the womb of your mother. And when you shall die, you shall go naked. So whatever you possess, that is given to you for proper use. We should understand that. The whole resources of material nature, they are under your control for making proper use. You can live comfortably. You can eat comfortably. You can live peacefully without any creating animosities or quarrel with your neighbors and prosecute your spiritual life so that you get rid of this material existence. That is the whole program of material nature. But misusing our developed consciousness, we are trying to misuse the resources of material nature in a different way for aggravating the sense gratification. That is the whole mistake. So Krishna says that "Whatever mistakes you have done, I don't mind. But you act in this way." Yajñarthe: "You work." Suppose you have misused your developed consciousness in so many ways and you are now entrapped. Suppose you have started a very complicated industry. Now, if I say that "This complicated industry is not required by you. You simply require some fruits and grains to eat. Why you are engaging yourself into this complicated and dangerous form of earning your livelihood? Stop it." No, that is not possible. That is not possible. Now you are entangled. You cannot stop. Sri Krishna says that "Don't stop your work, but by the result of your work, you try to make sacrifice for the cause of the Supreme. Then your entanglement will be automatically loosened." The whole energy which you apply in your industry, if the result is offered to Krishna, that means that energy is utilized for Krishna, not for that industry, but for Krishna. That is the thing. Just like Arjuna. What was he? He was a military man. He was not a sage. He was not a learned brahmana. He was ordinary, royal family, belonging to a royal family, kingly order, and a householder, family man, having children, wife, and a military man. But what...? How Arjuna became the greatest devotee of Lord. The Lord certifies, bhakto 'si priyo 'si me: [Bg. 4.3] "My dear Arjuna, you are my very dear friend as well as a great devotee." Now, what is the reason? He was not a sannyasi. He was not a Vedantist. He was not a philosopher, nothing of the sort. Still, you will find in the Fourth Chapter, Lord says, "Oh, my dear Arjuna, you are very dear to Me, and you are My great devotee." Now, if a person becomes very dear to the Supreme Personality of Godhead, then what else he wants more? How he became so? He became by this karma-yoga. Karma-yoga. He was a military man, and the problem was before him, whether to fight with his kinsmen or not. That was his problem. Now, mind that. He was fighting man in the beginning, before hearing the Bhagavad-gita , and he remained a fighting man after hearing Bhagavad-gita . Similarly, suppose you are engaged in some particular type of work before hearing this Bhagavad-gita . And after hearing, understanding Bhagavad-gita , you will have to remain in the same position, not that after hearing this Bhagavad-gita , as you are kindly coming here, you will have to take a dress like me and give up your family connection and become a mendicant like me. No, no. It is not meant like that. You have to change your mentality. That's all. What is that mentality? That mentality is that you are working for your sense gratification, and you have to change your mentality for gratifying the sense of the Supreme Lord. That's all. We are working... Ordinary work means for, working for our own sense gratification. "I want to eat this," so I eat. I purchase from the market. "Oh, this is very nice thing, very palatable to my tongue. Oh, purchase it. I shall eat it." Now, when you become conversant with the philosophy of Bhagavad-gita , you have to think whether this thing is palatable to the tongue of Krishna. That's all. Now you are thinking, "Let me purchase from the store this nice thing. It is very palatable to my taste." And when you actually become a learned scholar of Bhagavad-gita , at that time you will have to think whether this thing will be palatable to Krishna. That's all. The whole thing is there. When you learn that thing, when you want to please Krishna and not yourself, then you become an expert spiritualist. That's all. So it is not very difficult thing. Very easy. Simply we have to learn how to reach that stage of life. You haven't got to change anything. The same thing, example, that Arjuna was a military man, a householder, a family man, before hearing Bhagavad-gita , and he remained the same family man, the same military man, but he became a great devotee of the Lord. That technique we have to learn. That technique is that Arjuna, in the beginning, he did not like to fight because he wanted to gratify his senses. He thought that "I shall be happy if I do not fight with my kinsmen because in the fighting my kinsmen will die and I shall be sorry. So what is the use of fighting like this?" That means the whole thing, whole program, is according to his own sense gratification. He did not know that this war field, this battle of Kurukshetra, was organized by Sri Krishna to kill all unwanted men of the world at that time, all unwanted men of that world. That was His plan. Now, this was disclosed to Arjuna. In the Eleventh Chapter you will find that "My dear Arjuna, I have given you all kinds of instruction to induce you to fight in this battle. But know you perfectly well that either you fight or do not fight, I do not mind. All these men who have assembled here, they are not going back home. They will be killed here. It is already settled. It is already settled. Now if you want to take the credit, you can apply your hands for fighting. That's all." So anything that is going on in this world, it is under the supreme supervision of the Lord. Mayadhyakshena prakritih suyate sa-characaram [Bg. 9.10]. In every... There is a philosopher's saying, "Not a blade of grass moves without the will of God." It is actually the fact. Everything... Now, we have to dovetail ourself with that plan of the Supreme Lord. That is called karma-yoga. That is called karma-yoga. So Arjuna understood it, and he dovetailed himself with the supreme will of the Lord. And when he was inquired, "Whether you are going or fight or not? 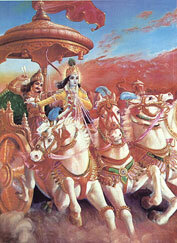 What you have settled after hearing Bhagavad-gita ?" he said, "Yes Krishna. My illusion is now removed by Your grace, and I have decided to fight. That's all." Now, that agreement of fighting and in the beginning of Bhagavad-gita , not to fight, that is the difference. In the beginning he was not in agreement with Krishna. He made so many arguments with Krishna against fighting. And at the end, he agreed. "Yes," he said. He became a yes man. So we have to become a yes man to the Supreme Lord. That's all. That is the perfection of our spiritual life. Now we are all "no men." God says this, I say "no." Stubborn. I say, "no." Now simply we have to say "yes". That's all. In everything we say, "no" at the present. Present formation of our existence is to say "no." Anything godly, we say "no." We shudder even by the name of God. We have come to a certain stage of our civilized life, that we want to banish God altogether. Not only saying "no," but we now prepare to agree to the point that there is no existence of God. So how much foolish we are becoming day by day in the name of advancement of civilization. You see? So we should correct this. Now, we shall try to understand our position and try to say "Yes, there is God, and I am servant of God." That's all. You have to learn that thing only. No more we have to say that there is no God. We may say there is no God, but that does not mean that there is no God. You see? Just like an upstart. He says that "I don't believe in the government. There is no government. I am all in all." So that madman say like that, that does not mean that there is no existence of government. He is a madman who says like that. So that sort of, I mean to say, madness, we should give up. We should be submissive. There is God. The only example—several times I have cited—that existence of God can be perceived with very simple... What is that? Just like you can perceive your existence in this body by the consciousness... You have got consciousness. That point we have discussed several times. That consciousness is the symptom of your existence in this body. So long that consciousness is there, this bodily function is going on very nicely. Now, you are eating. You do not know how your foodstuff is going to the stomach, how it is being transformed into different kinds of secretion, how it is being transferred from the stomach to the heart, how that secretion becoming red, and that red blood is again circulated from the brain to the toe. These nice machinery work is going on within your body. This physiological condition is present in your body. You are taking your foodstuff. The necessary juice, vitamins, are taken by the stomach. It is distributed, and the exhaustion of your body is supplemented, and the unnecessary things evacuated by stool, urine. The nice thing is going on. Now, as soon as this consciousness is stopped, will this function go any more? No. You will find the same brain is there; the same heart is there; the same stomach is there by dissection of the body. You will see the same veins. Everything is there complete. But only thing is wanting—that consciousness. Therefore everything is stopped. This is a common factor. Everyone can know it. Similarly, the whole cosmic manifestation which is present before you, so nicely going on, don't you think there is a consciousness behind it? How can you deny that there is no consciousness in the matter of sun rising, moon rising, seasonal changes, and so many planets floating in the air? So many wonderful things are being done in the material nature. Do you think it is without being done, consciousness? No. There is also consciousness. Just like for the management of your own body, due to the consciousness everything is being well done, similarly, everything that you see very nicely well done in the material nature, that is also being done by superior consciousness. This is human reasoning. How can you deny it? Can you deny it? I don't think any sane man can deny it. Similarly, as your consciousness is a symptom of your presence, you are spirit soul, similarly, the supreme consciousness is the symptom of the supreme soul, or God, the supreme God. This is the position. Now, as consciousness, we are part and parcel of the supreme consciousness. Therefore, the whole business of our life is to dovetail our activities with the supreme plan. That is called karma-yoga. That is called karma-yoga. Eko bahu syat. In the Vedic literature you will find that God has expanded Himself into many, just like the father expands himself into many children. The children is nothing but expansions of the body of the father. Similarly, we, all living entities, spiritual parts or living souls, we are also expansion of the supreme spirit. Now, the reason is, why the supreme spirit soul expanded himself into so many? What is the purpose? We have to understand. Now you can take the example. What is the purpose of father's expanding himself into children? A father takes the responsibility of maintaining the children. Why? Why he takes such, I mean, a grave responsibility, a family man. That "why" is answered—just to have happy and enjoyable life. That's all. Similarly, God has expanded into so many living entities because He wants enjoyment. He wants enjoyment. Because you will find in the Vedic literature that the nature of God is sach-chid-ananda-vigraha [ Brahma-samhita 5.1]. Anandamayo 'bhyasat: ( Vedanta-sutra 1.1.12)"By nature He is enjoying." So we must understand that God has expanded Himself into so many living entities just for His enjoyment. Now, we are meant for... Just like sons, children are meant for satisfying the father, similarly this is a common sense affair, that we living entities, we are meant for satisfying the Supreme. That satisfaction of the Supreme can be done by performance of yajña. That is the beginning. So here it is prescribed that yajñarthat karmanah anyatra [Bg. 3.9]. That is... We have discussed. Yajña-shishtashinah santo muchyante sarva-kilbishaih [Bg. 3.13]. If we perform sacrifice for the satisfaction of the Supreme, then the result will be that we shall be free from all reaction of our sinful life. And if we do not do that, bhuñjate te tv agham papa ye pacanty atma-karanat . Atma-karanat means simply for his own sense gratification. Now, that yajña, I have... Several times before you I have explained. Ashnati. Ashnati means one who eats. So our yajña begins from the eating, because eating is the first item of the necessity of our life. Eating, sleeping, fearing, and mating. Now, eating is essential. So here in the Bhagavad-gita openly speaks that just control your eating process in the yajña. Just begin your karma-yoga from the eating formula. Then, gradually, other things will develop. Because our senses... There are so many senses. We have got the eyes, the ear, the nose, the tongue, the hand, the leg, and so many. We have got ten, ten senses, sensory organs and working organs. So these organs there are. Out of all the organs, the tongue is the most uncontrollable organ, tongue. When we eat... Perhaps those devotees who eat with us, we chant this, that sharira abidya-jal jodendriya tahe kal: "This body is the encagement of our nescience, of our ignorance. And in that body the senses are our greatest enemies. Out of that, the tongue is the most powerful enemy." Ta'ra madhye jihwa ati lobhamoy sudurmati . Lobhamoy sudurmati. Because tongue is always hankering after palatable things, and it is making me bound up in so many reactions of my life... That is the secret. Therefore, in the Bhagavad-gita , in the beginning, the karma-yoga begins with the tongue. Yajña-shishtashinah santah . We have to eat. Now, we have to control the tongue first. How we can control the tongue? By offering sacrifice. By offering, we have to take foodstuff for maintaining our body. Now, if we offer the foodstuff, preparing to the Lord, that is called yajña. Yajña is not very difficult thing. You are preparing foodstuff for eating at your home. You have simply to prepare that foodstuff in a nice way so that you can offer to Krishna. That's all. Your process of eating or your process of securing ingredients for eating, or your cooking, nothing is stopped. Only, only thing is required that instead of cooking for yourself for the satisfaction of your tongue, you please cook it for satisfaction of Krishna. And take the prasadam afterwards. Now, take for example the other day we had some feasting. We cooked it nicely and offered Krishna, and then you took. What was the difficulty there? Was there any difficulty? So many gentlemen, you are present here who partook of that prasadam. How nicely it was prepared and how we enjoyed. So is yajña a very difficult thing? So it is not at all difficult. Simply we have to adopt the principles. That's all. And if we adopt that principle... Here it is clearly said that yajña-shishtashinah santah . Santa means these things are arranged by pious men and devotees of the Lord. Ordinary men, they don't care: "What is this nonsense yajña? Let us go to the hotel and take to our palatable things." You see? That is another thing. But those who are serious about solving the problems of life, let them take to this yajña principle. Is it very difficult? Not at all. It is rather pleasurable. What do you think. Mr. Green? You were also present that day. Did you not like? Prabhupada: So yajña is not difficult. Now, if by doing that yajña, if we become free from all reactions, then why should we not do it? Why should we not do it? There is no difficulty. There is no question of difficulty. Rather, it is a thing of pleasure, ananda. The whole thing is ananda. Ananda means pleasure. Enjoyment. Spiritual life does not mean that void of enjoyment, no. It is full of enjoyment. We are seeking after enjoyment, but that enjoyment is hampered by our material existence. We do not know. We are trying to squeezing out the senses and trying to have material pleasure. This is nonsense because we do not know what is spiritual life. Spiritual life means unlimited, unlimited pleasure. There is a verse describing about Rama. "Hare Rama, Hare Rama, Rama Rama, Hare Hare," we chant. Now, what is the meaning of Rama? That is described. Rama means ramana. Ramana means enjoyment. So yoginah. Now, mind that, karma-yogi. Those who are yogis, those who are trying to get spiritual life, regain their spiritual vitality, they are called yogis. There are different kinds of yogis: karma-yogi, jñana-yogi, dhyana-yogi, raja-yogi. The highest of all of them is the bhakti-yogi or the bhakta. You will find it. The highest yogi is he who is only Krishna conscious. Simply his life is full of Krishna consciousness. He is always trying to satisfy Krishna. That's all. And to satisfy Krishna is the easiest thing. Is the easiest thing of all yogic process. You haven't got to show your gymnastic power. No. 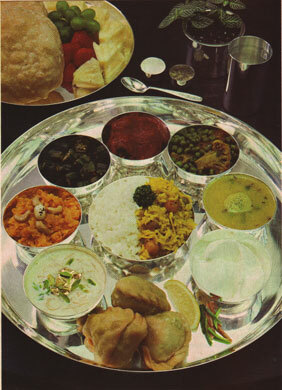 Simply prepare your good foodstuff, offer to Krishna, chant Hare Krishna and enjoy life. Yoginam api sarvesham . He is the best yogi. Best yogi. That is, You will find it. So begin it. What is the difficulty there? So far the techniques are required, we are present. The books are there. The literature are there. The authorities are there. Simply we have to agree. "Yes." Yes man. Simply you have to agree, "Yes," henceforward we shall become karma-yogi. Then, from that very point, your life begins. Karma-yoga. The yes man. Mind that, that instead of saying no to Krishna... Just like Arjuna said no in the beginning: "No, sir. I am not going to fight. You don't try to induce me, my dear Krishna." He argued so many things with Krishna. Then, at the last moment, he said, "Yes. I shall fight." So from "no man" to "yes man," that's all. So we have to agree. We are now "no men." We say everything about God, "no." Now we have to learn "yes." So you become yes man and begin this karma-yoga, beginning from your life of eating because eating you require. Without eating, you cannot exist. Therefore, Bhagavad-gita teaches you that you begin your karma-yoga from the point of eating. That... Now, why you should have to perform yajña? That is obligatory, not that you are very kind to prepare your foodstuff and offering to Krishna. It is very kind. No. It is for your interest. It is for your interest. Why? Now, annad bhavanti bhutani . You have to eat. Can you say that "Without eating, I shall continue my life?" No. That is not possible. You have to eat. Annad bhavanti bhutani . If you want to exist, if you want to maintain your body and soul together, then you have to take anna. Anna means foodstuff, or anna means grains, natural food. Generally, anna means foodstuff, and another technical meaning of anna—anna means grains, which is produced from the land for eating of the human being. For human being, so many things are produced from the land: the grains, the fruits, the vegetables, so many things. They are meant for human being. The grains are not meant for the tigers. The grains are meant for the human being. The fruits are not meant for the dogs. The fruits are meant for the human being. The milk. The milk is produced by the cow, but it is not meant for the cow. It is meant for the human being. If you offer the milk, 30 pounds of milk, after milking the cow, and if you offer to the cow, it will refuse. It will refuse, "I don't want it." Give it dry grass? Oh, it will be very glad. It will be very glad. So everything is organized by the nature. Now, there are so many scientists. They are discovering vitamin value from foodstuff. Now, what is the vitamin value in the dry grass? Can any scientist say that this is the vitamin value in dry grass? If there is no vitamin value in dry grass, how the cow is producing so much milk, who is full of vitamins A and D? How, from dry grass, vitamins coming out? Nowadays the physician prescribes some artificial vitamins for maintaining your body. Now, what is the vitamin there in the dry grass so that the cow is eating dry grass and giving you nice milk full of vitamins A and D, essential for your life? So these are all wrong theories, that "This contains this vitamin. This contains this." Let them go on. But natural foodstuff which is meant for human being, they are full of vitamins already there by nature's law, by God's wish. So annad bhavanti bhutani [Bg. 3.14]. You will be surprised. When I was family man, I had a servant who was only twenty-two years old. Oh, he was too stout and strong. You see? So one day I asked him that... His name was Buddhu. So I asked him, "Buddhu, what do you take that you are very stout and strong?" He said, "My dear sir, I take only these corns." Corns. You know corns? A corns and it is powdered. The powdered portions used to make bread, and the grain portion he used to cook as rice, and he was taking that. That's all. Prabhupada: Cornmeal, yes. And he was very stout and strong. He was deriving all the vitamins. Because he was poor man, he could not eat any butter or milk or any other things, meat also no, nothing of the sort. He was simply eating... He was drawing, at that time, only twenty-two rupees from me. Twenty-two rupees means... According to your American exchange, it comes to five dollars, five dollars a month, his income. And what he could spend? So he was taking the cheap food. But he was very strong and stout. So whole idea is that these grains, these grains are meant for human being. Coarse grain or fine grain, there are so many varieties of grain, varieties of rice, varieties of dal, according... Now, the fine rice, the basmati rice... The laborer class... In India, of course, we have got this distinction. They are not satisfied for, with this white rice. They want coarse grain for satisfaction. While gentleman class, they cannot eat coarse grain. They want finer grain. So all these varieties of grains and vegetables and everything is there by nature's arrangement, by God's arrangement. Here it is said annad bhavanti bhutani [Bg. 3.14]. Now, your body depends on the foodstuff supplied by nature. Annad bhavanti bhutani parjanyad anna-sambhavah . And these grains are produced by rains, parjanya. Parjanya means regular rainfall from the sky by the arrangement of God. It is not your arrangement. Rainfall is not your arrangement. It is supernatural arrangement. If there is regular rainfall, then it can produce all the necessities of our life. I think, Carl, you were reading from the Bhagavad-gita about Maharaja Yudhishthira's reign, during his kingdom how rainfall was regular, and the necessities of human being were being produced. So here is the same thing. Annat. Anna, the grains. Grains are our life's subsistence, human being. Annad bhavanti bhutani . And grains are produced by regular rainfall. Parjanyad anna-sambhavah . Parjanya means rainfall. And yajñad bhavati parjanyah: [Bg. 3.14] "And rainfall is produced when you offer yajña, sacrifice, to the Lord." Regular rainfall will be possible when people are engaged in the yajña. Otherwise, nature will control rainfall. For want of rain, all your arrangement—mechanical arrangement, tractors, and all these things—will all fail if there is no rainfall. So control of the rainfall is not in your hand. It is in supernatural power. So here it is said that rainfall is made possible by offering yajña, by sacrifice. Parjanyat... Or yajñad bhavati parjanyo yajñah karma-samudbhavah: [Bg. 3.14] "And yajña is prescribed according to the Vedic rituals." And if your karma is regulated by the direction of Krishna, just like Arjuna regulated his karma, his warfare, by the direction of Krishna, then by regulation of karma, you perform yajña, sacrifice, and from, for your performance of yajña, sacrifice, there is regulated rainfall, and from regulated rainfall there is sufficient production of grains and foodstuff, and from your sufficient foodstuff, you can grow yourself, body, maintain your body very nicely. The whole program is like that. "Therefore, my dear Arjuna, if you begin your life by performance of yajña, then that means at once your life becomes spiritualized. At once your life becomes spiritualized, that what you want." Now, here is injunction that "That is the circle." That is the circle, that how to work. That injunction is there. Now, why your, or this work? Any work. Suppose you will drive a motor car. That is a sort of work in the street. There is injunction that "You should drive on the right. You should stop your car when there is red light. You should not proceed an inch." So, so many regulations, even for your driving car, anything... Anything of your life—you want to do—there are directions, proper directions from the authorities. And why not for your spiritual life? Why not for? For spiritual life you can do anything and everything, whatever you like, what you manufacture in your own brain? No. How can you do it? In every field of your work, in practical life, you have got some direction, that "You have to act in this direction." Suppose you are working, running on a factory. Oh, there are so many factory laws. Anywhere you go, there are direction from the superior authorities. So is there no direction for your spiritual realization of life? Yes, there is. We have to abide by that. Therefore Lord says, evam pravartitam chakram: "This is a circle, circle, that in Vedic literature, Vedic scripture, they give you direction how to work." And by working you perform yajña. By performing yajña, you have got regular rainfalls. By regular rainfalls, you get production of grains. And by production of grains, you eat and live happily. So this is a circle. This is a circle. So Lord says, Lord Krishna says, evam pravartitam chakram . Chakram means circle. This is a circle.